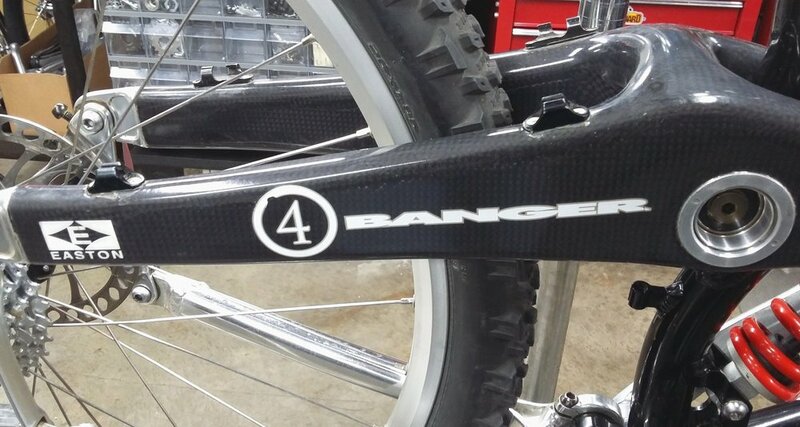 Bringing a ‘Schwinn 4 Banger’ back from the brink. Towards the end of 2018 the door to the shop opened to a guy wheeling in a bike that definitely has a place in the time line of mountain bike evolution. The bike in question is from 1997 and had been owned by the gentleman since new. Nowadays when we say the name Schwinn we do not tend to think of cutting edge design and quality but, back then they were always pushing the edge of the envelope. When you see mountain bikes from the 90’s alongside modern day ones they always look very small and delicate, however that was not the case when the Schwinn 4 Banger was parked in the showroom. Everything about this bike was designed to be ridden hard. A full suspension design, it sports the most solid looking swing-arm I have ever seen on a bike and, added to that, it is made out of carbon fiber… This is back when carbon was not that well understood but we knew it was cool so used it anyway. Nowadays we lay-up carbon using varying amounts of layers at different stress points and following a very light and hollow structure using shape and design for strength. The method back in the day was to make it thick and solid and then add some more carbon to it. Then, when it was finished add another layer, then one more for luck. After lunch a meeting would be held and a decision would be taken to add 3 more layers. The next morning, after sleeping on it, the design team would hold another meeting and voice their concerns over the carbon issue and another 4 layers would be added. This would continue for some days until finally the factories stock of carbon fiber had been completely used up. I may have exaggerated slightly but you get the idea. The main front triangle is more traditional in design and build. It is crafted using a high grade aluminum with oversize tubing. The front suspension unit was also ahead of its time and used a design at the cutting edge from the top name in 90’s bike forks, ‘Marzocchi’. A double crown model and full open oil bath system in both legs. The swing arm in all its carbon magnificence. I would imagine the same amount of carbon as in your average passenger jet, although don’t quote me on that. The Marzocchi double crown fork. This particular model is the Junior T. They made a Mr T as well as many other versions over the years. Anyone familiar with the TV show the A Team in the 80’s will get the link. Although on first appearance the bike looked in good condition, it was clean and obviously stored inside, however, closer inspection revealed a few problems which later turned into full blown “issues”. Firstly the Hayes disk brakes. The brakes are some of the original hydraulic units that Hayes produced and they were light years ahead of anything back then. The model is the Mag although there was never any logo telling you this on the things, just the purple Hayes logo. For that reason they had nicknames such as “Purple Stoppers” or “Purple Pullers” etc. the list is endless depending on your location and the creativeness of the local riders. As good as these things were, like any hydraulic system, service is essential. Even modern units suffer after a few years without a fluid flush and a clean, these poor little guys had not seen any love since being bolted onto the bike and whoever that was is drawing social security now. Problem 1. I already mentioned the fork, however, this too was suffering. The open bath units are basically a system of springs spacers and shims that, ideally, should luxuriate in a bath of pristine oil. Needless to say the last vestiges of oil evaporated from this fork during the Clinton administration. Lastly and perhaps the most serious of all the “Issues”, we found a crack in the frame at the head tube. Now, cracks usually signal the end of a bike project, next of kin are informed, tissues are handed out and the bodies taken to recycling. In the odd instance though, we have a bike that needs to be kept going, so we switch on the life support and break out the big hammers. The bicycle was stripped down to a bare frame and the crack was project one. We drilled at the end point of the crack to stop it spreading, ground a recess and had it TIG welded. Pam then cleaned and buffed the area and color matched the paint and blended it back. You can hardly tell we were there at all. Next the fork. It was completely disassembled and all the parts cleaned in the parts cleaner. Needless to say no fluid was left inside after all the years and the only sign of oil was the dried on discoloration on the springs and shims. After everything was looking shiny we started to think about putting it back together. The weak links in any fork are the rubber seals. These are very delicate things that usually break down quickly and fail entirely when they dry out. I say usually because the one make of seal out there that bucks the trend are the old Marzocchi units. I swear these things have some alien origin and use a form of rubber only found in other galaxies. Come the apocalypse the only things still thriving will be cockroaches and Marzocchi fork seals. Thus it was with this fork, once everything was cleaned, reassembled and filled with new fork oil the fork was as plush and bouncy as new. The last area of concern were the brakes. A phone call to our contact at Hayes confirmed what we suspected, no service parts are available for these old original levers. However, surprisingly you can still service the caliper units and replace the quad rings in there. So that is what we did. The front brake is completely original and fully serviced, the lever, or more correctly the master cylinder was disassembled, cleaned and rebuilt along with the caliper. There are a couple of options for replacement pads, sintered metallic, and both front and rear were replaced. The rear master cylinder turned out to be the permanent retirement of the whole renovation. When the unit was pulled apart the whole of the inner body, which is some form of plastic, had completely failed and wedged itself in the master chamber. So we looked at possible options for replacement. Matching calipers to master cylinders is a bit of a technical affair as all calipers have different requirements when it comes to fluid volumes and levers of different models push different amounts. In the end we settled for a Hayes “ Prime Comp” which we fitted to a high flow Jagwire hose and then retro fitted the rear caliper to take the new system. For any body out there with a similar problem and looking for a way to fix it, this works really well. The original threaded caliper hose fitting. The new fitting, in gold, mounted to the original caliper. This picture also shows another reason these calipers need to be saved. The mount design. There is no modern equivalent to this mount, it was only used on these Hayes units and is no longer used by any manufacturer. The only other option would be to machine an adapter plate. Ready to roll once again. The original Hayes Mag with the unique right angle mount. New Jagwire high flow hose system converted to fit. All original here, just cleaned, rebuilt and new brake fluid. Swing arm cleaned and all pivot points serviced. So, there we are, another classic saved from the scrap heap. Shame about the rear brake lever but some things are unable to be salvaged. I would probably have opted to replace both levers myself, as I think it probably won’t be long before the other one fails in the same way. Also I like symmetry on the bars. This was the choice of the owner however and he preferred the option of only changing what was necessary at the time, he felt it told a story and showed the bike had been ridden hard. I kinda agree, at least now it can write a few more chapters. Posted on January 18, 2019 by Mark Allchorn and filed under Renovation and tagged MTB Classic Schwinn 4 banger Hayes Brakes.